There was some doubt that Edgar Wright’s borderline action-musical might well become a case of style over substance. And whilst it’s true that Baby Driver does at times teeter on more than a couple of edges, the good news is that Wright proves more than adroit at taking his audience right up to those edges, making them look perilously over them – and them dragging them right back. And often into a whole new direction. The “word” on Baby Driver – from post-Ant-Man disaster inception to its current marketing push, has been the uniqueness of Wright’s approach to score – writing the movie, and then directing and editing not just its action, but it’s everything – to the killer pop soundtrack he chose before he penned any of its scenes, having fought to secure the rights to his song choices even before he started shooting. It sounded like a noble experiment – but an experiment nonetheless. And from the first blast of the Jon Spencer Blues Explosion’s Bell Bottoms, closely followed by a brilliant opening titles coffee-run sequence that plays like a hard edged La La Land to the strains of Harlem Shuffle, it’s clear that Wright knows what he’s doing. But it’s not an idea that necessarily sustains a whole movie – and Baby Driver’s triumph is that Wright gets this. Thus his film, for all its stylistic notions makes sure its stand out moments are not stand alone moments. For all the brevity of his broadly drawn characters – known by monikers (even Monica as it turns out) – they all have some degree of heart and soul, and manage to engage beyond the technique of the film. Yes, even Ansel Elgort. Previously the cinematic equivalent of a black hole sucking the life out of everything that surrounds him – here, his strange distance and uncertainty (which we had always taken for lack of talent) actually weirdly works, as the tinnitus-suffering get away driver Baby, scoring his life – and his life of crime – to the tunes of a vast array of (now) vintage iPods. As good as he is here, he is no match for Lily James, who charms the very edges of the celluloid she devours, proving once more that she is just passing through on her way to being a major movie star. Equally impressive – and more importantly, supportive of the whole enterprise – are Spacey, Foxx and, especially Hamm, who each bring their own distinct form of menace to the movie at various points. 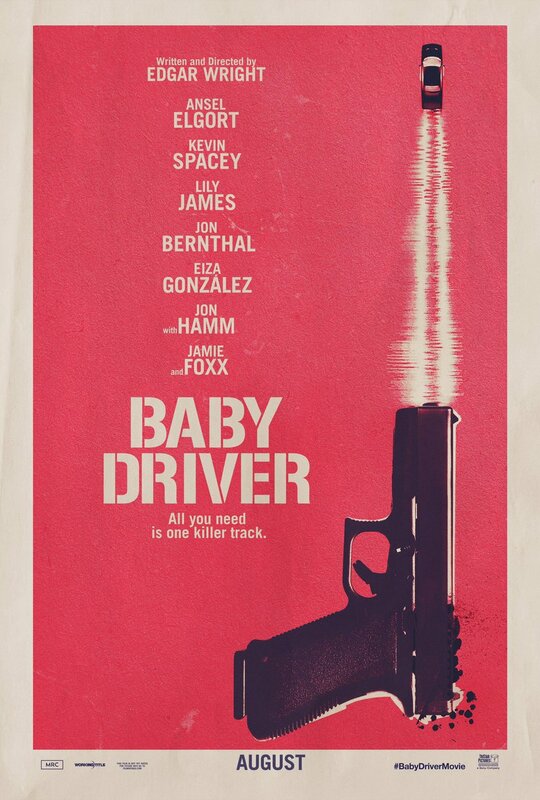 Guillermo Del Toro recently described Wright’s movie as “An American In Paris on wheels and crack smoke.” And whilst Del Toro is, as ever, prone to hyperbole, the man has a point, for Baby Driver, by being an amalgam, actually manages to be something pretty original. It’s an action movie that might just be a musical, a car chase-bank heist film that seeks to be a romance (on many levels – for girls and cars, and lost opportunities and the potential of redemption.) It doesn’t always work as well as you’d like, but you also start to admire its small fails. So even if the final act becomes more Ferris Bueller meets Terminator 2 than it does Bullitt takes down The French Connection – you’re really having too good a time to be all that bothered. And when that titular Simon & Garfunkel song finally kicks in at the end, well, we scoot down the road with it and wonder how your engines feel no longer.